The Colombia 2014 Round is advancing and the government is finishing the offer that it will take to the market, which includes 97 blocks that the National Hydrocarbons Agency (ANH) and Ministry of Mines and Energy (MinMinas) will be put onto the auction block. The National Hydrocarbons Agency (ANH) has unveiled some of the specifics for the 2014 Colombia round production block auction, from which it hopes to attract over US$2.6B by assigning 112 blocks. It has been revealed the Colombia’s largest private oil operator Pacific Rubiales (TSX:PRE) sent a letter to Ecopetrol (NYSE:EC) in March to formally ask the NOC to apply its STAR secondary recovery technology immediately and not wait until the 2016 contract ends. Reclame Colombia, an activist group advocating small scale mining over multinational, large-scale projects, held a debate in Bogotá on the future of the Rubiales field after the concession contract held by Pacific Rubiales (TSX:PRE) expires. 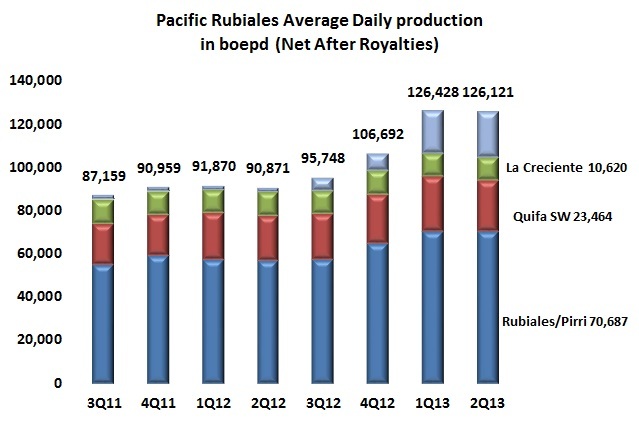 Canadian Pacific Rubiales Energy (NYSE:PRE) has proposed that it deploy Synchronized Thermal Additional Recovery (STAR) in the Rubiales field to boost its current production and hand off current primary production to Ecopetrol (NYSE:EC) once the current production contract expires in 2016. In the absence of an agreement between mining firms Drummond and Cerrejón over methane gas and coal reserves in La Guajira, the government has said it will step in and impose a decision to break the ongoing deadlock over how to extract the resources which share the same block. 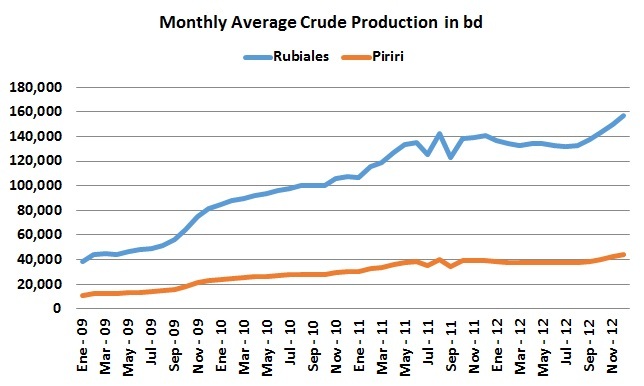 Colombian Senator Maritza Martínez Aristizábal has tightened her message on the Pacific Rubiales and Ecopetrol relationship, and requested that Ecopetrol assume control of the Rubiales oil field. National radio station W radio announced that Omega Energy Colombia has bought the assets of Russian oil giant Lukoil. The assets consist of the Condor association contract in the Llanos basin, foothills area. Lukoil had 70% of the contract in partnership with Ecopetrol. The estimated reserves are 6.09M boe but nothing has been produced since 2007 (3,700 boe for the year). National business newspaper Portafolio reports that in 2013, the National Hydrocarbons Agency (ANH) will invest US$153.4M in subsurface studies in many areas of the country. The ANH will do this investment with the purpose of provide subsurface information to prospective investors, since in 2012 Round some companies chose not to invest in certain areas due to lack of geological knowledge. The contract for the Achapo area was signed with the company Canacol Energy Colombia SA on October 31, 2012. The contract authorizes Canacol for hydrocarbons exploration and production in a 5.057 m2 area of the Caguán Putumayo basin. The expected investment is US$7.8M total investment.